Several years ago, I received a small gift from a seasoned Scouter. As I lifted a piece of smooth cloth from a small cedar box and placed it on the palm of my hand, the patch intrigued me. 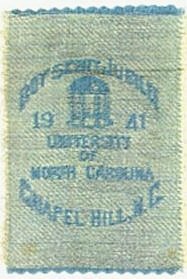 Fine light-blue and white-cotton threads wove a pleasant background for the darker blue embroidered letters, "University of North Carolina Boy Scout Jubilee 1941," centered around the historic University "Old Well." As an avid historian interested in state Scouting activities, I was eager to find out more about the Jubilee. I searched through endless reels of newspaper microfilm files at the local college library for information on this long ago event. Various copies of aged old blurry-black newspaper print afforded me first-hand accounts of the daily activities. And led me to track down local attendees to interview. The story of the Carolina Jubilee and it's historical significance is interesting. North Carolina was an innovator in organizing state-wide camporees within both the nation and the former Region Six (North Carolina, South Carolina, Georgia, and Florida). 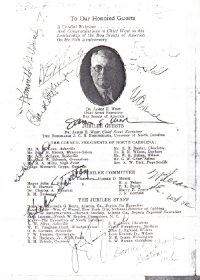 The Carolina Jubilees were held in 1935, 1938, and 1941, and resembled a small-scale National Jamboree. All three events were organized as the culmination of the hard work by a special Jubilee Committee and the promotion and support staff led by professional Scouts from the state and region. 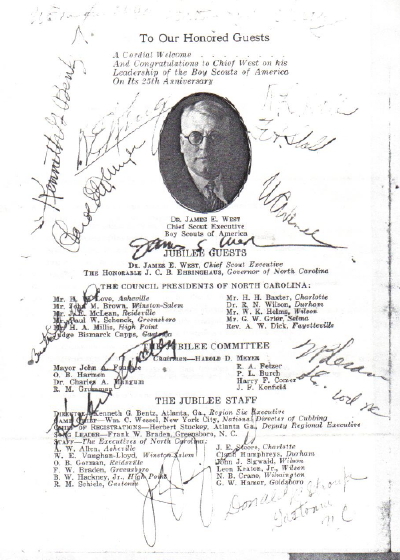 The idea arose in 1934 to host a special North Carolina celebration recognizing the 25th anniversary of the Scouting movement, which would be commemorated in 1935. Later in August, a National Jamboree would be held in Washington, D.C. to recognize the milestone. The Jubilee was North Carolina's tribute to strong contributions of Scouting in the state. Over 1,200 Scouts and Scouters attended from throughout the state. That first Jubilee was held in conjunction with the third annual Dogwood Festival on the University of North Carolina campus, in partial to promote the Scouting program to 8,000 public visitors. The UNC courtyards lined with plush-green grass and tall oak trees were an ideal site for this important event because the university grounds extended a sense of historic state tradition and was centrally located in the state. 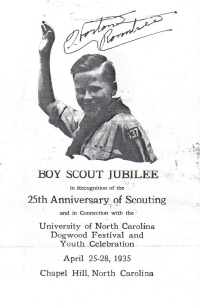 Due to a tragic outbreak of polio, the National Jamboree was canceled and the Chapel Hill event became the highlight of the year for the Region. 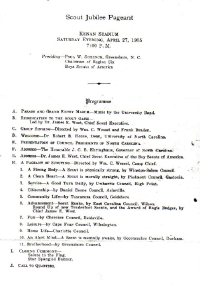 A Jubilee Committee comprised of eight volunteers led by Dr. Harold Meyer on the UNC faculty and a member of the Region Six Executive Committee, coordinated the event. He oversaw it's location, facilities, University cooperation, and military supplements. The Region Six Scout Executive at the time was Kenneth Bentz from Atlanta, who served as Meyer's professional counterpart. Council contingents were organized in troops. Scouts wore tan uniform shirts, lace below-the-knee knickers, multi-colored neckerchiefs, and brown-wool campaign-style hats as they neatly organized thier camping sites arriving on Thursday afternoon, April 25th. Olive-green army pup tents dotted the attractive woodland encompassing Emerson Field, the old athletic stadium located inbetween the Tin-Can gymnasium and the Old Bell tower, which all landmarks were in sight of the projected gray-concrete sides of Kenan Stadium. 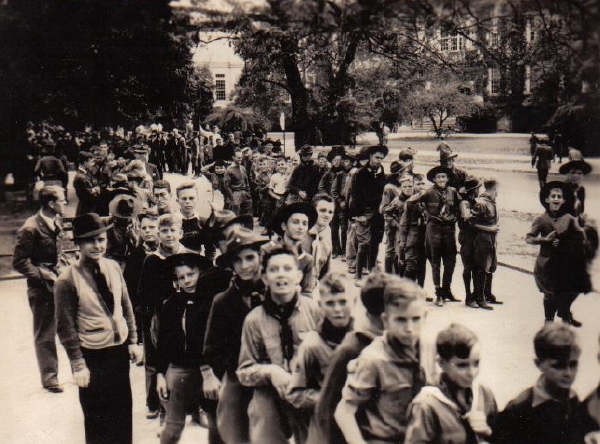 Daily activities included events for both individual Scouts and patrols with an emphasis on Scouting skills, drill exercises, and a tour of the University's historic campus. Each night a campfire was well-planned and included songs, skits, and influential speakers. The weekend was highlighted with a special Saturday night Scout pageant, which was also seen by visitors and guests. All twelve councils in the state were responsible for a specific portion of the campfire. 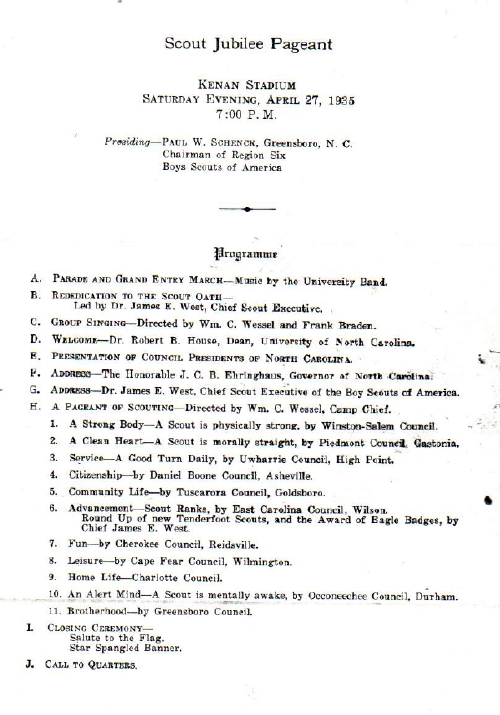 The captone was the presentation of new Eagle Scouts by Dr. James E. West, then Chief Scout Executive. North Carolina Scouts convened again in Chapel Hill for the second Jubilee three years later. Attendance increased to 1,425 participants throughout both North and South Carolina. 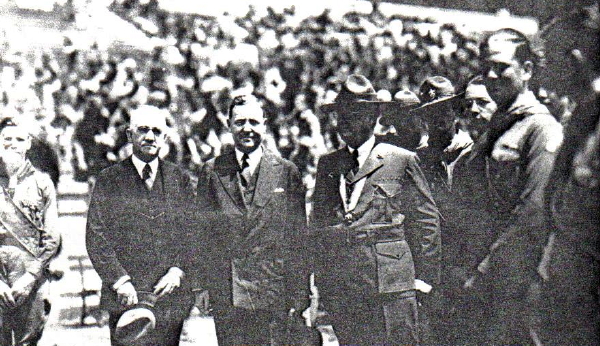 While events remained basically the same as the first event, this time Scouts were privileged guests at a UNC-Tulane football game at Kenan Stadium. Eagle Scout Terry Sanford, a former United State Senator (D-NC), past state govenor, and past President of Duke University, represented the national Scouting fraternity Alpha Phi Omega on the jubilee committee. Sanford helped to organize the evening campfires and coordinate a luncheon meeting of alumni Scouts with Dr. West. Sanford shared his memory of the event with me, "I vividly remember meeting Dr. James E. West and talking with him in an open car. In fact, after the Jubilee I had considered becoming a Scouting executive, but my career turned in various other directions." A small light-blue felt patch with the words "Carolina Jubilee" embroidered in white thread was presented to participants who attended. Just a few months shy of the beginning of the Second World War, the last Jubilee was held, attendance increased to 1,500. Representatives as far away from Florida, Georgia, and South Carolina joined thier brethren in North Carolina. Participants attended the season opener football game against Lenoir-Rhyne College. "You will find this experience most helpful in any time and everything you do. It is particularly vital in times of emergency....or possibly war.....when you might be called to give directions, carry a message, or perform any other of a number of services that required exact accuracy." Dobson's inspiring words transcended the thousand some odd youth who intently listened thinking of their futures. The United State convened on an international battleground three months later. �Annual Reports to Congress, BSA, 1935, 1938, 1941. �Wilson Library Archives, University of North Carolina, Chapel Hill. �The Daily Tarheel, University of North Carolina, Chapel Hill. �The Chapel Hill Weekly, Chapel Hill, NC. �The News and Observor, Raleigh, NC. �The Daily Reflector, Greenville, NC. �Judge Horton Roundtree, Personal Interview, 1987. �Carl Knott, Personal Interview, 1991. �Honorable Terry Sanford, Personal Interview, 1992.